It’s here, it’s finally here. 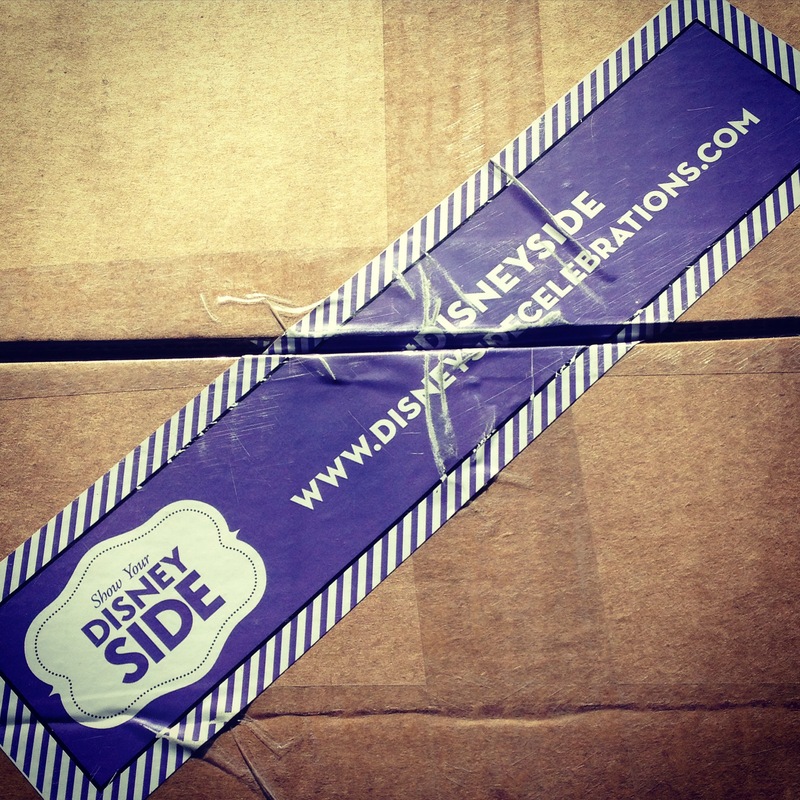 My DisneySide @Home Celebration kit is finally here and I still can’t open it. 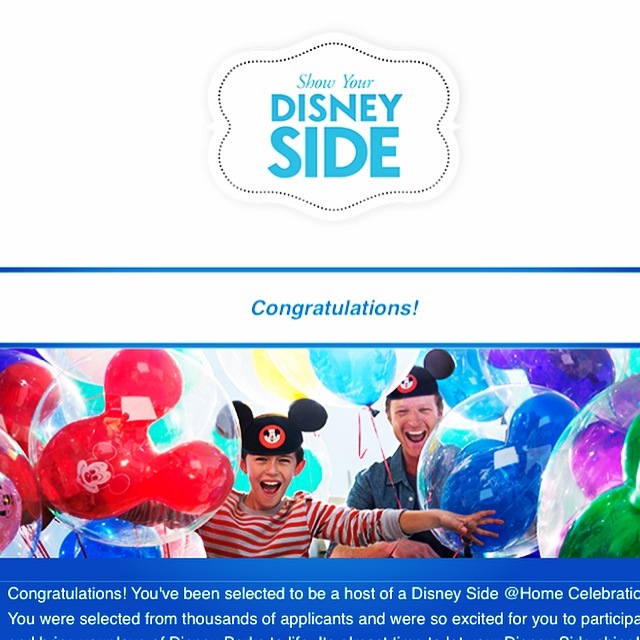 One day that seems like an eternity ago but was really only back in December I opened my email to find an invitation to apply for a DisneySide @Home Celebration. I was over the moon with the thoughts that this year I might get selected to be a host. I followed the link provided to submit my application. Imagine my surprise when I got to the section to fill out where I was from and there were no options available for Provinces only States. Oh no, did this mean they were only accepting applications from people in the US? I hadn’t seen any disclaimer/rules saying it was not open to Canadians and since I’m not one to give up, I improvised. I didn’t select a state; I let the survey default to the blank selection and then entered in Ontario, Canada on the second address line and hoped for the best. A few days later I received the following email. In early January I started to see other Disney lovers and bloggers that I chat with post about having received congratulatory emails that they had been selected. Since I hadn’t received an email, I was feeling a little discouraged until I spoke (ok, I texted, but spoke sounds more personal) to another Canadian who was in the same situation and she encouraged me to email BSM Media directly. As some great philosopher once said the answer is always no, if you never ask, so I emailed them directly and asked. Well guess what, I had been selected and was told I would be receiving my email soon. YIPPEE!!! I was elated. 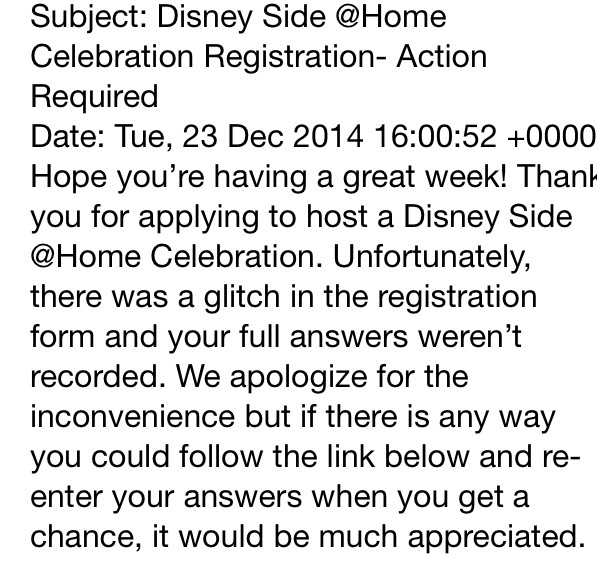 What a great excuse to show my #DisneySide (not that I need one) and have a party. Now it was time to wait, and wait, and wait and wait some more for my package to arrive with items to help throw my party. Finally today after stopping in eleven different cities in 2 different countries over 6 days my package has arrived. But guess what, I have to wait some more. Why? Because it’s my husband’s birthday today and he deserves to have his special day without me jumping up and down in excitement over something besides him. So my package sits on the table waiting and taunting me. I REALLY, REALLY hope my husband takes pity on me and suggests we open it tonight. I’ve got my fingers crossed. Before I get into why I love Disney PhotoPass Photo Books to show my #DisneySide, let’s start with some basics in case you are unfamiliar with the Disney PhotoPass service. Here is a quick summary. As you wander around Walt Disney World, Disneyland, ESPN Wide World of Sports or even Aulani you may see photographers (often wearing a tan vest) with camera in hand or on a tripod and wearing an official name tag. These are Disney PhotoPass Photographers who can take your picture when asked and then scan it onto either a PhotoPass Card or your MagicBand. To claim your photos after your holiday is over, you will need to create an online account for Disney PhotoPass Service then enter the code from your PhotoPass Card or MagicBand to retrieve your photos. Once you have retrieved your photos you can edit them with the multitude of options available for customization including stickers, borders and graphics. As a word of warning, if you don’t purchase the photos taken by the Disney PhotoPass Photographers they will expire 45 days after they are taken so if you plan to use any of their photos in your Photo Book you need to create it within this time frame. 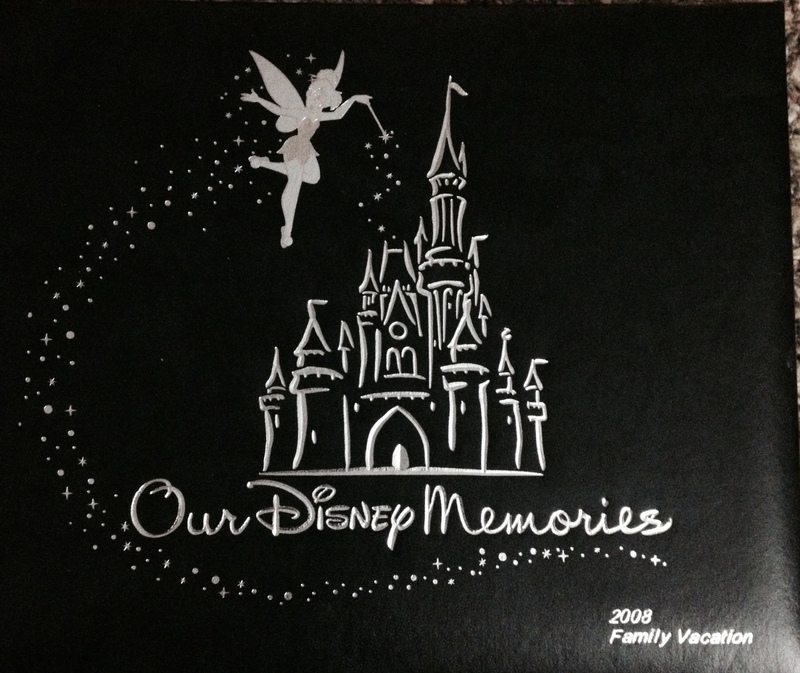 Disney offers a Memory Maker product for $199 that provides digital copies of all photos taken by their photographers and scanned to your PhotoPass Card or Magic Band. Memory Maker can be purchased more than 3 days before your trip, at a reduced rate of $169. 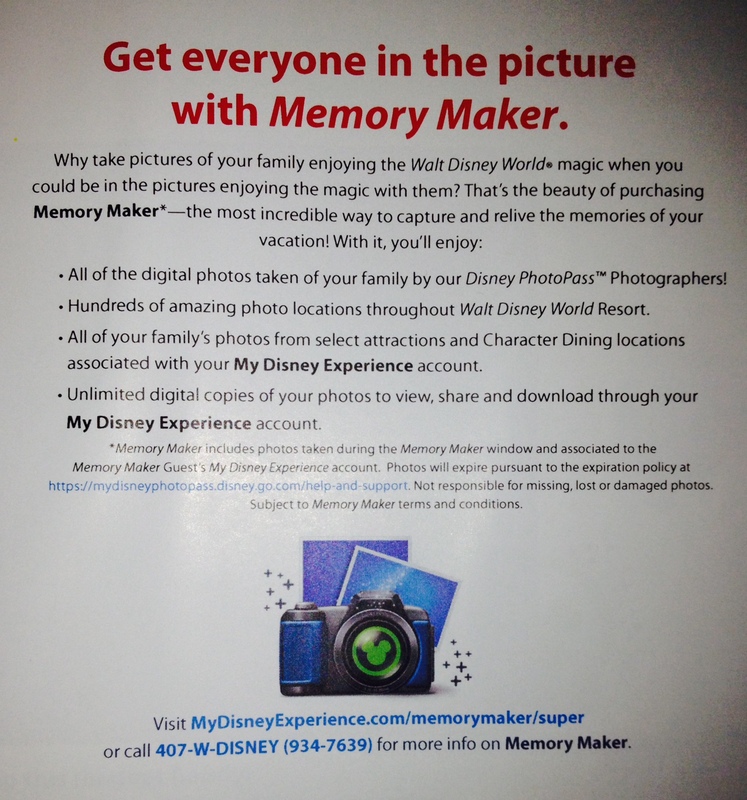 Memory Maker appeals to many people who want to be able to post the pictures taken by the Disney PhotoPass Photographers to social media and/or share with friends and family. You can then also print your photos for putting in an album or use for scrapbooking, etc. 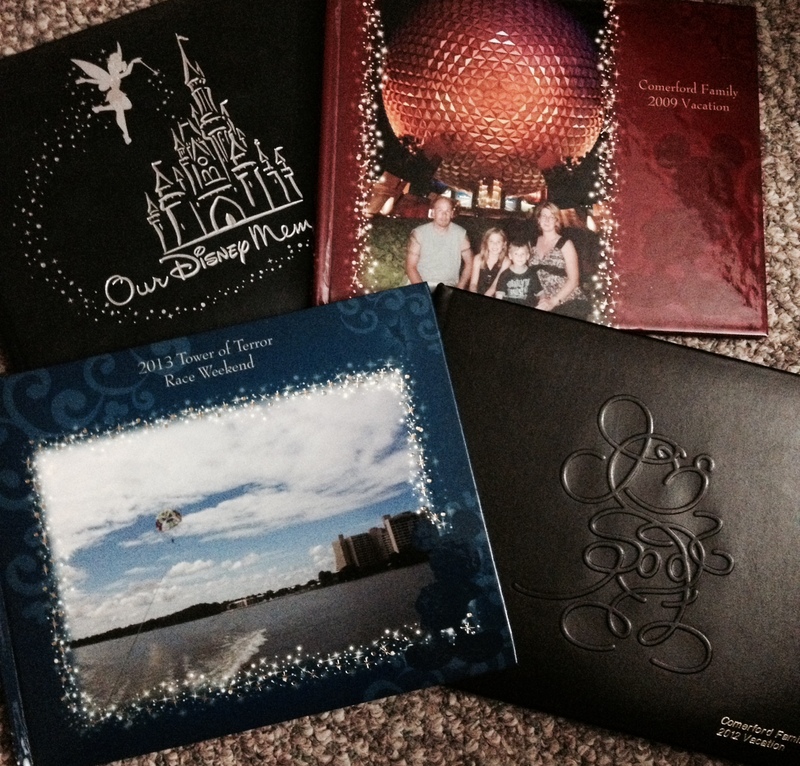 Now back to why I love the Disney PhotoBooks so much. My husband was a professional photographer for years and takes a LOT of pictures when we are away so we always have way more than enough photos for me to post to social media sites without having to purchase the Memory Maker package, so as great as it is, I prefer to use Disney PhotoPass website to create a Disney Photo Book. I upload my favorite pictures taken by my husband and also use some from the Disney PhotoPass Photographers to make my album. I get to pick my album cover, layout (pictures per page), background and stickers to make it exactly the way I want it. Once finished, I place the order and a few weeks later this wonderful Photo Book arrives. It is essentially a professionally produced hard cover book like I could purchase in a book store with good quality glossy paper for the pages. The only difference is it is designed by me with the photos and comments I want. I know I could create a beautiful scrapbooked album myself but honestly I have better things to do with my time than print my photos, hunt for funky paper, cut and paste everything together all without monopolizing the kitchen table for a week or more, or having one of my cats think it’s a great game to scatter everything across the floor so I have to start all over again. Aside from the reasons set out above, for me using Disney’s website to create my Photo Book and thereby show my Disney Side is more cost-effective. 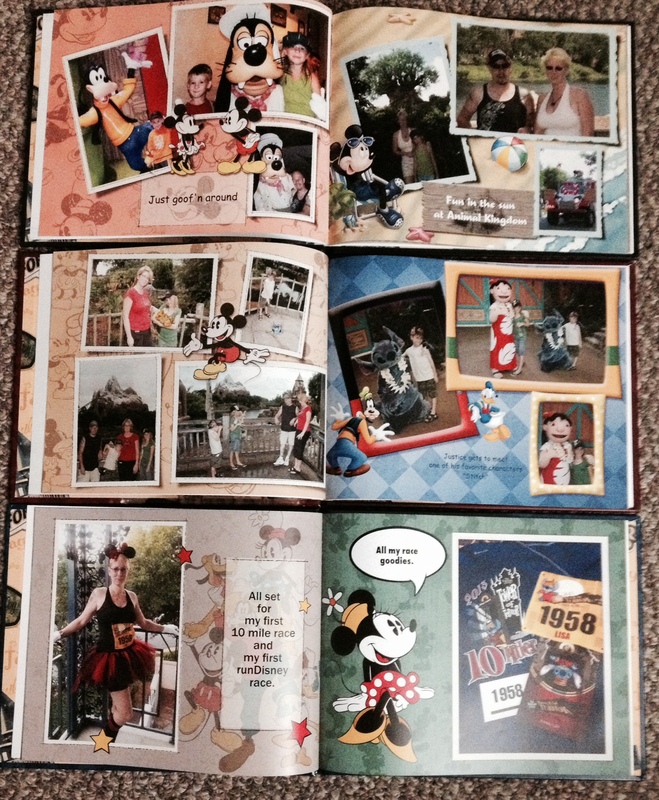 The basic Disney Photo Book comes with 20 pages for $79.95 but you can add extra pages in increments of 2 for $3.50 each extra. I always go over the original 20 pages. I would end up paying way more than this if I purchased Memory Maker, scrapbook paper, an album and printed the photos. There is also the option of just saving the photos my husband takes on our external hard drive to pull up and view on our computer when we want to but I personally prefer having a book to take to family events to show everyone or just to look back at and reminisce with the kids. They are keepsakes filled with love that I cherish and they sit in a place of honour on my book shelf. I can’t wait for my next one to arrive any day now. 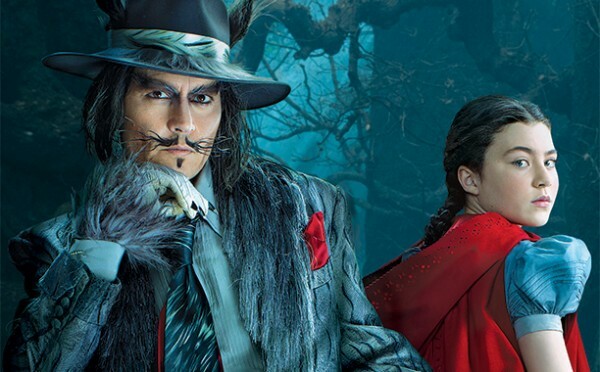 Last week my daughter and I went to see the movie “Into the Woods” and having heard many mixed reviews ahead of time I was concerned we would not enjoy it, but we did. I am glad however that my husband and son did not join us. I know my husband would have gotten up and walked out like a surprising number of people did during the movie. This movie, to me, is a musical in the true sense of the word because a lot of dialog is sung not just a few sporadic songs. This reason alone would be enough to deter many from watching it, my husband included. The basic premise of this movie is that a baker and his wife who have been unable to have children discover the witch next door has cursed their family and if they want the curse lifted they have to obtain a list of items and bring them to her. All of these items can be found within the stories of various fairy tales and this is how the fairy tales are intertwined. It is a creative mix of stories and characters that you would not originally think could be combined into one plot. Meryl Streep plays a convincing witch and while I adore Johnny Depp his lecherous wolf character made me uncomfortable. If that was the intention then he was successful but I had a hard time reconciling myself to seeing him in this roll. Anna Kendrick’s portrayal of a Cinderella, who walks away from the royal life she initially craved, was both sensitive and strong as required. As a lover of the Brothers Grimm I appreciated the dark twists that were included from their original telling of these stories. Unfortunately many people have not read and are therefore unaware of the often macabre and violet nature of the original stories. The cutting off of one step-sister’s toes to try to get her feet to fit in the glass slipper garnered an audible gasp from some in the theatre who were obviously unaware of this version of the story. The movie was not all doom and gloom however; I loved the light hearted, corny interplay between the two princes as they waded through a stream singing about their romantic woes and tearing open their shirts in a show of male ego and competition with one another. All in aIl, I am definitely glad I ignored the negative reviews and went to see this movie anyway.